MEDIA RELEASE – Tomorrow or Ashes, a novel by Richard M. Baker, Jr., is being released as a Web-e-Book®, part of a rare collection of Baker’s newly edited novels. The Tri-Screen Connection, LLC, publisher and distributor of the e-book, is providing the technology platform and online shopping website for the Tomorrow or Ashes e-book. In the novel Tomorrow or Ashes, Richard M. Baker, Jr. introduces us to his backyard in a masterful marriage of fact and fiction. The author transports us across the Fore River in Portland, Maine to the working-class community of fishermen and fish processors on Commercial Street’s waterfront piers in the early 1960s, a time of erosive loss of business and jobs to competitive operations in Gloucester, Massachusetts. In Portland, three to five hundred fishing industry workers hang on to menial jobs on the city’s decaying wharves. Baker builds a powerful story from the wretched setting and plight of Mildred Day, a young fish-cutter with enough pride and foresight to hope for something better. Through her, Baker reveals much about the less fortunate burdened with thankless jobs and the humiliation of demeaning social persecution. The author recruits nineteen-year-old Millie to the cause of protesting a sorry state of human existence by finding a way out before becoming a victim. Page-by-page, inch-by-inch, Millie is given the chance to be a heroine for tenacity. Hindered by the indignation of her low, social status and lack of inexperience, Millie escapes one trap and falls prey to others as we follow her flight from down and out to up and fighting. 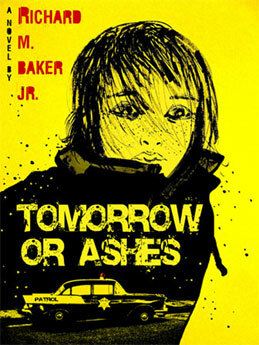 Tomorrow or Ashes contemplates the possibilities when a young adult calls upon her last reserves of hope. Tired, under-fed, misjudged, Millie Day is determined to find a better tomorrow despite the smoldering remains of her past. Priced at US $5.95 – read on-line, no download or installation required. The Tri-Screen Connection represents a launch pad for broad adoption of new-media communications services, including digital content and publishing. Our publishing strategy is to satisfy the market for literature of excellence that provides reflective insight to a wide range of human experiences.